NEW YORK (WABC) -- The public launch of a new program replacing payphones throughout the city with free Wi-Fi and phone calls will be announced Thursday. Mayor Bill de Blasio will be there as LinkNYC turns on its tablet capabilities for the first time. 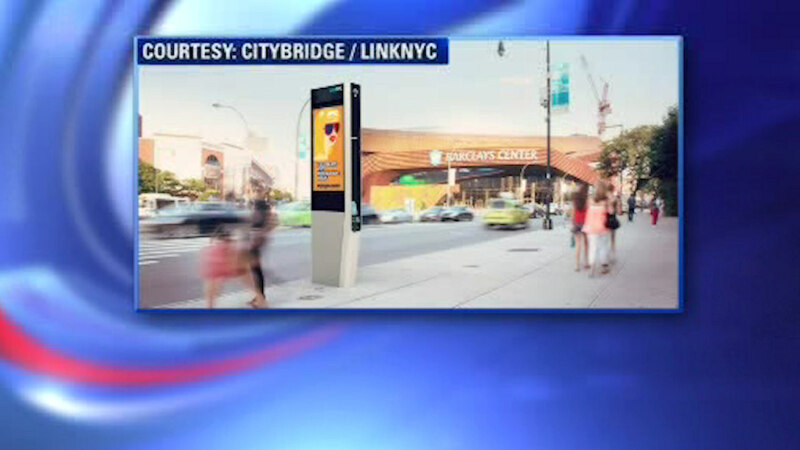 LinkNYC is a first-of-its-kind communications network providing super-fast Internet hotspots at no cost to taxpayers. Each Link will provide secure, private, and free Wi-Fi, and two free USB charging ports to charge devices. Free phone calls to anywhere in the US, City services, maps, and directions will be accessible using the new Link tablets. At least 510 Links will be installed across the five boroughs by July 2016, and at least 7,500 will be installed over the next eight years. LinkNYC is being built by CityBridge, a group of companies comprised of experts in technology, user experience, connectivity, and advertising that includes Intersection, Qualcomm, and CIVIQ Smartscapes. The project is being managed by the NYC Department of Information Technology and Telecommunications, the City's lead technology agency.